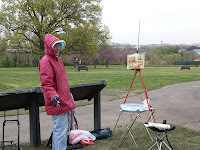 (Art League Plein Air Painters) at the Netherlands Carillon in Arlington Virginia. The Carillon,which was a gift to the USA from the Netherlands, tops a hill with a magnificent view of Washington. To the right of the Carillon is Arlington National Cemetary and to the left is the Marine Corp Memorial with the famous Iwo Jima sculpture. We turned in circles trying to decide what to paint and in the end we all chose the same view. Although the weather was not what was promised (when is it ever?) we weren't as disppointed with the cloudy day as we first thought. The tulips were at their peak and the colors were much richer in this light than they would have been on a sunny day. The sky was interesting with the light piercing through the clouds so I got right to that so it wouldn't be lost. If the morning had turned sunny I would have had to change it all. I was surprised how quickly this one came together. Donnie Seale, who is one of our painters, works nearby so he stopped by on his lunch hour to see how we were doing. I had just hit a snag as I was putting in the tulips and I was glad to have Donnie there to help me decide where I was going. It all flowed once I decided on the brightness of the flowers. Thanks Donnie! I have titled this post "Another Grain of Sand" because it is the thought that went through my head as I completed this painting. I was pleased with it and then immediately said to myself "so what, it's a drop in the ocean, just another grain of sand". Hmmm beach metaphors... well I am at the beach maybe that is why I am feeling small and insignificant? The truth is I feel like this often after I finish a painting. I did say this blog was about the highs and lows, well that feeling is one of the lows. When I am working on a painting I am so engrossed it doesn't matter to me who will see it or what they will think of it. It has all my attention. Then it is finished and it either lands in the "pile" or it gets a frame, gets wrapped up and stuck in a closet until there is an opportunity to show it. I paint a lot of paintings, I have been painting a lot of paintings for a long time. Some find homes and that is good. 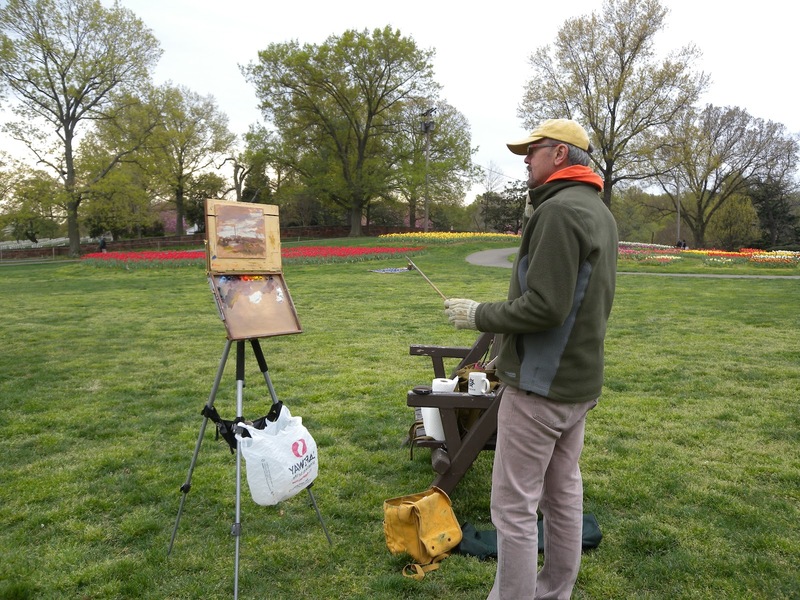 However, there are many painters painting many, many paintings. I go to Facebook and I am inundated with image after image of wonderful paintings being painted everyday. I visit online galleries and other artists websites until I am on sensory overload and my head is spinning and I realize I am one little painter in a vast sea of painters. I am thankful for every person who sees one of my paintings and perhaps for a moment shares my inspiration and the enthusiasm and optimism I felt while painting it but in the final analysis I have to paint for myself. That has to be enough. If I work to be successful, known, a famous artist then I won't know what to paint. It will make me nuts! Ah, the tortured artist. That makes me a real one right? I reported in my last post that we are back here on the Outer Banks of North Carolina and after several foggy, gray days the skies cleared. The last two days have been magnificent! I took advantage of the gray days to relax, read and recharge my batteries, the three Rs. Yesterday I went into the village and along the sound for a photo shoot. I didn't have enough time to paint as I had some seasonal work to do back at the house. Clean deck furniture, make a list of things to be fixed and take stock of the garden. The latter is in surprisingly good shape with a lot of things blooming. I should probably paint it before we leave. Today I was itching to paint! The light was almost blinding it was so intense. Everything was brilliant blue and white only slightly interupted by the gray green of the land and buildings. We are located on a neck of land less that a quarter of a mile wide. We are bordered by Currituck Sound on one side and the Atlantic Ocean on the other. Talk about brinksmanship! If you could have experienced the skies here today it would have seemed pointless to paint anything else. I decided to paint from the west side of our house overlooking the Sound because it was very windy and I was able to find a shady spot with protection from the strong southerly gusts. Thunderstorms were threatened and I wanted to be able to move quickly remembering a close call this time last year! Look Who's Coming to Breakfast! ﻿ Here we are back in Duck on the Outer Banks. Just after dawn this morning I looked out and we had company stopping by in time for coffee:) Happily I had my camera nearby but just as I was about to snap the best picture, the deer silhouetted against the rising sun, my battery went dead. Of course it did! I moved as quickly and quietly as possible back in the house to unearth a fresh battery and made it back in time to capture a couple of more images. Too bad it was so gray out. We have had two days worth of heavy fog which lifts briefly and then there is a white out. Actually, I'm not complaining because it was a great excuse to lie around read and watch old movies. I really needed a break but now I am getting the itch to start painting again. The fog lifted enough for a sunset tonight and I think the forcast is good for tomorrow. If not I brought a painting with me that I can finish indoors. I'll keep you posted! I made some subtle changes to "A Favorite Spot" which I showed you a couple of posts back. You might not even notice the difference so I won't say what I did. It was just some very small details that I thought needed improvement. Now I feel it is finished! This week I am busying myself with preparations for the Outer Banks. That means finishing up things in the studio like the painting above, continuing to frame for the June show at the Ratner and prepping panels to take with me to the Outer Banks. I would rather take the time to do that now instead of eating into painting time at the beach. I hope I come home with some frame worthy paintings like those in February. I also hope the weather is as fine there as it is here right now. I did spend most of today outdoors but instead of painting I was working on the garden and getting ready for planting. It smelled and felt great! 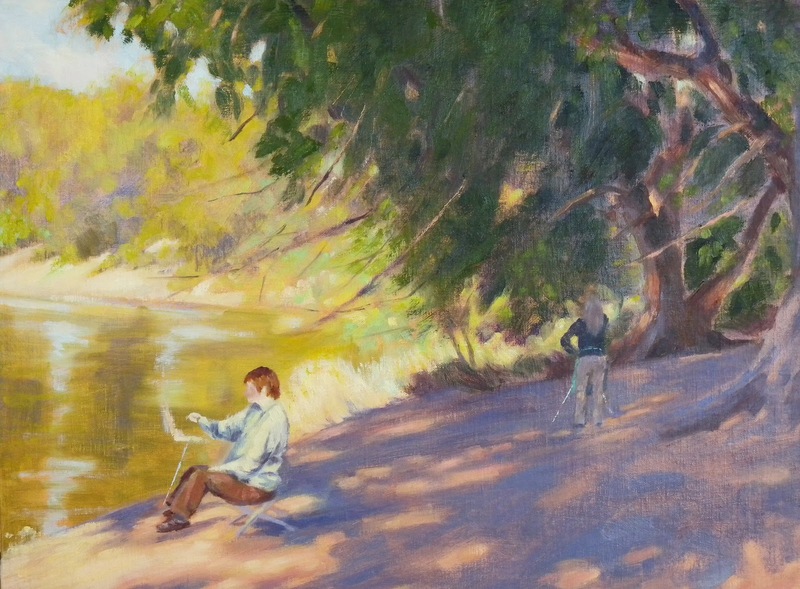 ON EXHIBIT at the Art League Bin Gallery for the month of March is this plein air painting I did back in February. It has become a favorite of mine and looks good in its black frame with an antique gold lip. I do hope it sells! I will probably save my next post for the Outer Banks. It is always something of a challenge since I work from my laptop and don't have the software on it that I have on my desk computer. At the very least I will be able to post where and what I am painting. 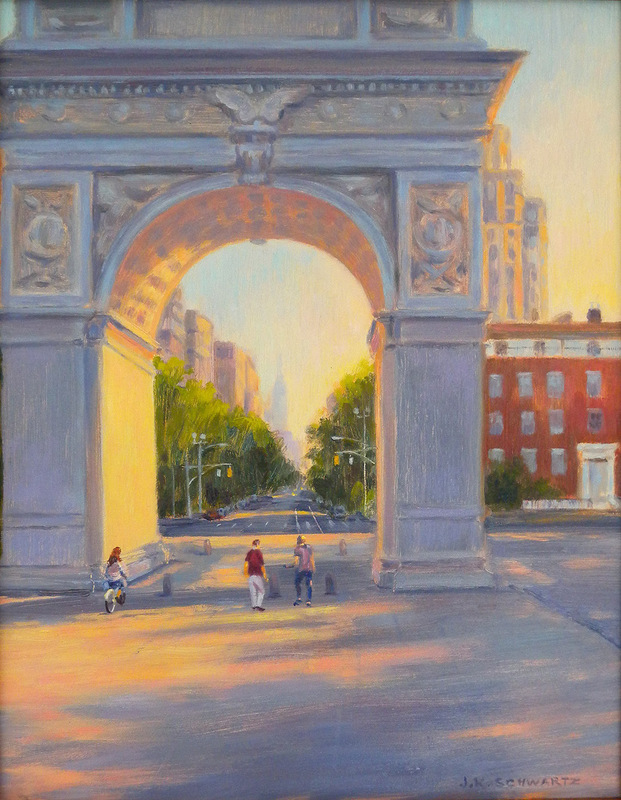 This is the third painting I did in my Washington Square series. For those of you who are not familiar with the Washington Square Arch it is located in Washington Square Park in Greenwich Village which is a neighborhood in lower Manhattan. As you look through the arch you are looking up 5th Avenue. The Empire State Building is seen in the distance and is located at 5th Avenue at 34th Street. Here 5th Avenue ends in Waverly Place which runs across it. An ealier painting I showed you was titled "5th and Waverly" and If you go back to August or September in the Archives list you can see that painting progressing step by step. The golden summer morning light is quite as beautiful in New York as anywhere else. I think it gives a different more sympathetic view of the City. This painting comes up for auction at the second auction in the 2012 Salmagundi Club Spring Auction series. The auction starts promptly at 2:00 PM this coming Sunday, March 11th. If you are a regular reader then you may be tired of hearing about the auction. However, I do want to keep you informed. The auction takes place live at the Salmagundi Club, 47 5th Avenue http://www.salmagundi.org/ and at the same time online at Live Auctioneers http://www.liveauctioneers.com/. As I learned from last Friday's auction Live Auctioneers provides a screen for viewing the actual auction and there are buttons to push should you wish to make a bid. Pre auction bids are already being accepted. The quickest way to get to the Salmagundi Auction and view all the paintings is to go to the Salmagundi link I gave you and on the left side of the opening page you will see a listing for SCNY Spring Auction. Just hit info and the remaining two auction pages come up. "Through the Arch" is lot #81. Well, it is sort of complete. As I look at it here I see some things that could be improved so I may have one more "tweaking" session before I declare it completely finished. I think getting it out of range of my brush for a couple of days would be a good idea as I don't want it too finished. 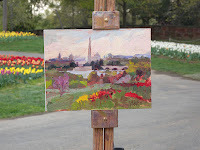 Even though I worked from a photo of that particular day painting with my friends I made sure I kept it loose as though it were being painted on site. A few posts back I addressed the issue of working from photographs and to summarize..I don't have a problem with it so long as they are my photographs and I had the actual experience. When I work from them I enlarge them and tape them up where I can see them and approach the painting as if I were on site. In this particular photo my easel was shown in the foreground. In the beginning I was going to include it but I edited it out in favor of this which I think makes for a better composition. To the left is the painting I painted that day. 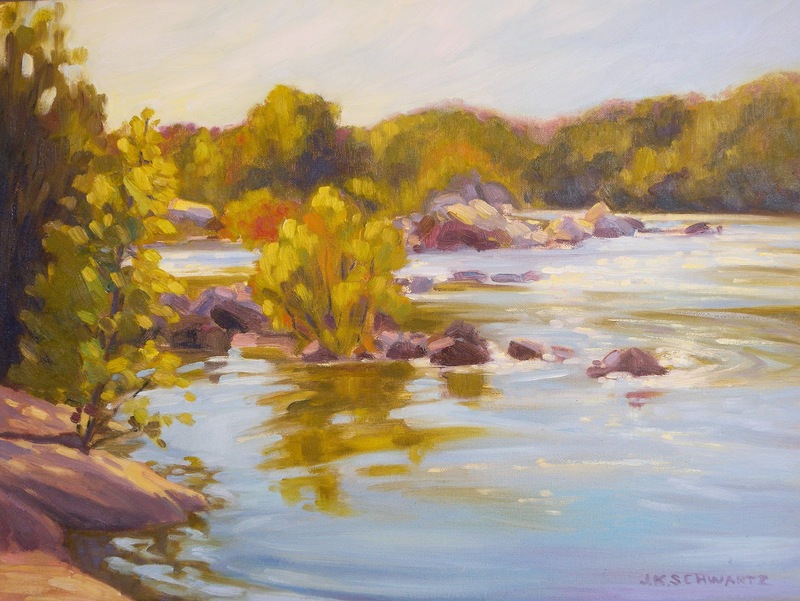 In the painting above my friend Susan is facing up river with her back to us, Bobbi is on her camp stool painting the cliffs on the other side of the Potomac. 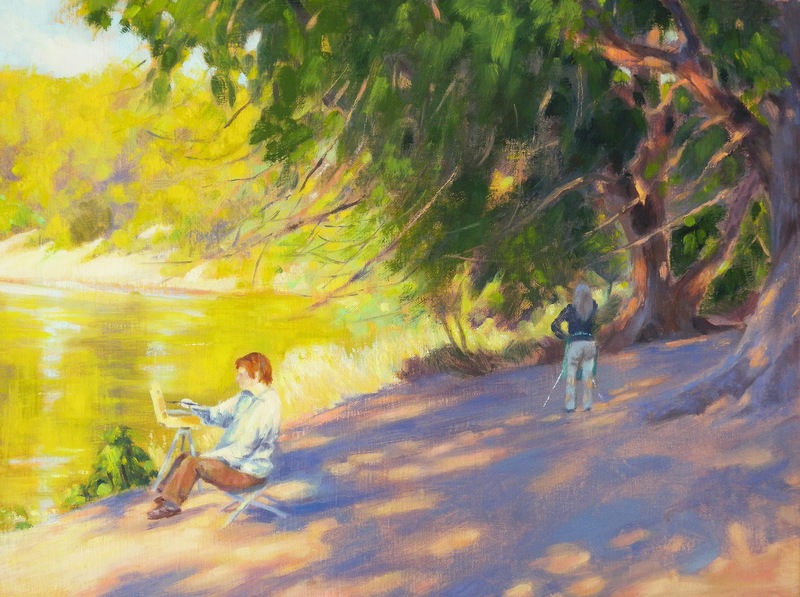 My easel was placed in the foreground and I was facing down river where the water hit some rocks and became more agitated. Well, it is Saturday and as promised I got back to work today as a painter and put some of the business behind me. At least for a little while. I was going to start something new that I could do in one session because I have had trouble getting back into the three paintings I have already started. Instead I found myself lured by the colors and light in this painting of two of my fellow Art League Plein Air Painters at work along the Potomac. Back in the fall I posted some paintings that had been painted at Wide Water along the Potomac in Maryland. This is the spot where they were painted and these were two of my companions. I will most likely finish it tomorrow. Last evening I had fun watching the auction at the Salmagundi Club that I have been going on about in the last couple of posts. I knew it could be followed online at Live Auctioneers but I did not know that the actual, live auction would be viewable. "Primal"was lot #54 and the hammer came down on the final bid which was an online bid. I found out today that the bid was from Los Angeles and the bidder was a woman I had gone to high school with and have connected with in recent years. That made the sale REALLY special! Mickie, I am so glad it is going to be living with you! Yesterday I told you all about the project Isabelle Garbani is going to install in April at the Chenlong Wetlands in Taiwan. I want to give you another link for her where you can read about the project and also an email address so you can arrange to send her plastic bags if you are so inclined. I think the more places the bags come from the better as it really underscores the global aspect of this. The link is www.isabellegarbani.com/news.html/ If you would like to email Isabelle and find out how and where to ship bags to her please contact her at igarbani@netscapes.net She needs a lot of bags before she leaves on April 12th! Also during this time I have been involved with the other artists I am exhibiting with in June at the Ratner Museum in Bethesda Maryland. We needed to get images together and make some decision about the card to be printed to advertise the show "Landscapes and Other Visions". At the end of the day we hired the designer who did the card for my solo show last May and she came up with another stunner! So, that job is done. Each of us is now conentrating on which pieces we want to exhibit. I do need to get over there and look at the actual space again. 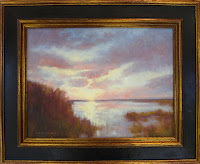 I already have the paintings I want to show and just received some of the frames for them today. Tomorrow I will put on my framer hat and work on that job. By Saturday I hope to be back to being a painter again! 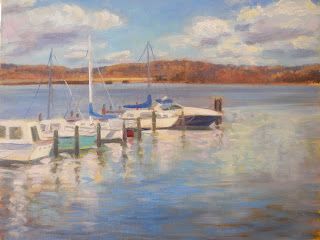 Meantime, I serve on the Board of Trustees for the Art League in Old Town Alexandria. We are a non profit 501C organization and it is a place and a group of people who are near and dear to me. We have a real lot going on! I mentioned the Earth show that we will sponsor in April, "Earth" the state of the Planet"and how we have created the League of 25 so that we can find 25 donors to give $100 each to come up with the $2500 needed to sponsor the show. These donors will then become a member of three teams in a sculpture competition with found objects that are provided for them. Then I had an aha moment! I read a post on Facebook that New York Installation artist Isabelle Garbani was one of 6 artists invited to Taiwan in April for the Chen- Long International, Environmental Art Competition. Isabelle designed and manages my website. Her presentation sketch was for her Invasive Species project where she makes florets out of recycled plastic bags and artfully covers a building with them. Wow! I thought. That's the same month we are celebrating Earth. I had already been saving plastic bags for Isabelle for her Knitting for Trees installation and had just sent off a box last week. Why not help her on a larger scale while at the same time bring more attention to our own exhibit. Let's send Alexandria's plastic bags to Taiwan and therefore be a small part of it and help make Isabelle's job easier. Make the focus global, that is what the show is about. So that is exactly what we are going to do! The bright green collection box with images of the project and an explanation will be set out at the Art League Gallery tomorrow through March 16th and the word has gone out on the Art League blog and the Art League Tidings as well as Face Book. I am hoping for LOTS of bags. 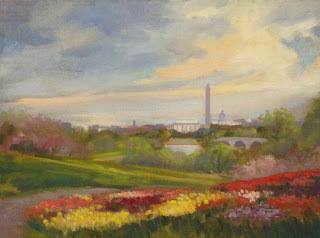 You can see Isabelle's work and project posted on the Art League blog at http: http://www.theartleague.org/ Hit connect with us and then choose read our blog on the menu. Under recent posts you will see one regarding a GLOBAL EFFORT. You should also visit http://www.knitfortrees.com/ http://www.isabellegarbani.com/ or...you can always go up to the right hand corner of this blog where members are listed and hit the thumbnail with the knitting on the tree. That is Isabelle and all her contact information will come up. One of the truly satisfying aspects of being an artist is being part of a community of artists. Harnessing all that creativity can have wonderful and powerful results! I am physically tired but mentally stimulated. It makes sleeping a little difficult:) I finally got my stuff off to Isabelle for a web update so drop in and visit my website http://www.jeanschwartzpaintings.com/ . Here on the blog I hope to have both new and updated work to show you in the next couple of days.